The Purair® SafeSEARCH uses ductless carbon and/or HEPA filtration technology to capture hazardous drugs, chemical vapors or biologicals that may be encountered during routine package processing. SafeSEARCH installs easily and requires no additional facility ductwork. SafeSEARCH is specifically designed to protect technicians, public service workers, and at-risk employees from drug particles fentanyl and carfentanil. 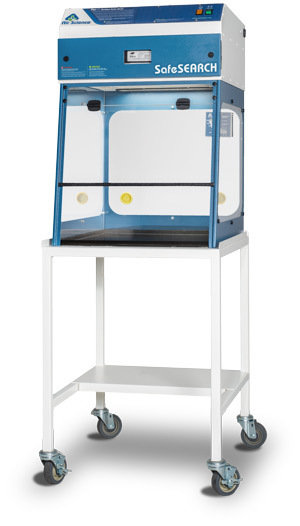 Available in three standard sizes, the Purair SafeSEARCH can be installed in mailrooms, airports, facility receiving bays as well as police departments, forensic laboratory facilities and mobile crime labs. SafeSEARCH cabinets provide an added layer of protection against suspicious packages. Options for customized SafeSEARCH cabinets also allow for more specific applications to ensure personnel safety. Get a quote today or visit the SafeSEARCH product page for more information and product literature.